Let there be light, says the Bible. All the firmaments of technology, all our computers and networks, are built with light, and of light, and for light, to hasten its spread around the world. 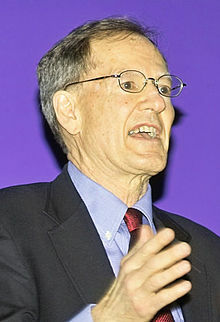 George Gilder (born November 29, 1939) is an American libertarian philosopher, futurologist and author. From Newton, Maxwell, and Einstein to Richard Feynman and Charles Townes, the more men have gazed at light, the more it turns out to be a phenomenon utterly different from anything else. Futurists falter because they belittle the power of religious paradigms, deeming them either too literal or too fantastic. Let there be light, says the Bible. 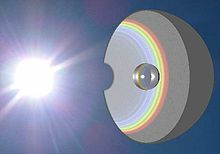 All the firmaments of technology, all our computers and networks, are built with light, and of light, and for light, to hasten its spread around the world. Light glows on the telescom's periphery; it shines as its core; it illuminates its webs and its links. From Newton, Maxwell, and Einstein to Richard Feynman and Charles Townes, the more men have gazed at light, the more it turns out to be a phenomenon utterly different from anything else. And yet everything else — every atom and every molecula — is fraught with its oscillating intensity. I'm not pushing to have [ ID ] taught as an alternative to Darwin, and neither are they... What’s being pushed is to have Darwinism critiqued, to teach there’s a controversy. Intelligent design itself does not have any content... Much of what I've written about has been in reaction to the materialist superstition, the belief that the universe is a purely material phenomenon that can be reduced to physical and chemical laws. It's a concept that's infected the social sciences as well. The analogy between Shannon and codes in biology isn't something that sprang from my belief in God... except maybe on some deeper or more transcendent level. Academic scientists of any sort expect to be struck by lightning if they celebrate real creation de novo in the world. One does not expect modern scientists to address creation by God. They have a right to their professional figments such as infinite multiple parallel universes. But it is a strange testimony to our academic life that they also feel it necessary of entrepreneurship to chemistry and cuisine, Romer finally succumbs to the materialist supersition: the idea that human beings and their ideas are ultimately material. Out of the scientistic fog there emerged in the middle of the last century the countervailling ideas if information theory and computer science. The progenitor of information theory, and perhaps the pivotal figure in the recent history of human thought, was Kurt Gödel, the eccentric Austrian genius and intimate of Einstein who drove determinism from its strongest and most indispensable redoubt; the coherence, consistency, and self-sufficiency of mathematics. Gödel demonstrated that every logical scheme, including mathematics, is dependent upon axioms that it cannot prove and that cannot be reduced to the scheme itself. In an elegant mathematical proof, introduced to the world by the great mathematician and computer scientist John von Neumann in September 1930, Gödel demonstrated that mathematics was intrinsically incomplete. Gödel was reportedly concerned that he might have inadvertently proved the existence of God, a faux pas in his Viennese and Princeton circle. It was one of the famously paranoid Gödel's more reasonable fears. As the economist Steven Landsberg, an academic atheist, put it, "Mathematics is the only faith-based science that can prove it." This page was last edited on 25 August 2018, at 01:25.